We explain what the term area means and how children are taught to calculate the area of a shape. Area is the term used to define the amount of space taken up by a 2D shape or surface. We measure area in square units : cm² or m². 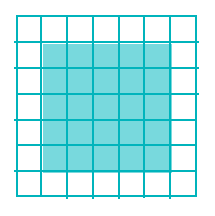 Area is calculated by multiplying the length of a shape by its width. In this case, we could work out the area of this rectangle even if it wasn't on squared paper, just by working out 5cm x 5cm = 25cm² (the shape is not drawn to scale). In Year 5 children will be expected to use the formula (length x width) to work out the area of a rectangle. They will often be given rectangles not drawn to scale, so will need to remember this formula. They also need to estimate the area of irregular shapes. In Year 6, children will need to work out how to find the area of an irregular shape, such as the following. Often, not all the measurements of each side will be given to make this harder. A good way of finding the area of a shape like this is to split the shape up into smaller shapes and then work out the area of each of these. The areas of the smaller shapes can then be added up to find the answer. Children in Year 6 also learn to calculate the area of parallelograms (base x height) and triangles (base x height ÷ 2). A rectangle has a perimeter of 36cm. What could the area of this shape be? There is more than one possible answer to this question. One way of working out a possible answer would be to draw a rectangle and then work out what the sides could be if the perimeter is 35cm. This will probably involve a lot of trial and error. A child may finally arrive at the measurements: 10cm and 8cm. To find the area, they would need to remember the formula for area (length x width), so multiplying 10 x 8 to make 80cm².